We will explore this issue through some thoughts and theories I have developed through many years of observation. Many of these thoughts and ideas stem from my comparison of the desert bighorn sheep population in the Newberry Mountains to populations in other mountain ranges. Due to the same classic problems that have plagued wild sheep populations throughout the Western United States the Newberry herd had dwindled to perhaps 25 to 50 head and were completely isolated. In my opinion there were two particular events that happened to the Newberry population approximately 100 years ago that was significant to this herds decline and almost extinction. The first one was the human occupation and drying up of Newberry Springs. There were once two different water sources that were close enough to one another to be considered one for these purposes, and were collectively called Newberry Springs. The one to the east was where the railroad used to get its water and distribute it throughout the desert. The one to the West was behind the gas station and motel in downtown Newberry. When I was a kid this one still provided enough water to fill a small swimming pool. These two water sources were point mineral water sources that provided the water and minerals for this population of desert bighorn. To clarify a point mineral water source is a term I use to describe a place where there is liquid water and minerals where the sheep can use the minerals straight from the ground usually in a powder form. These two resources are typically within 100 to 200 yards of each other. I believe that having these two resources in close proximity allows the individual sheep to better regulate its water and chemistry balance and therefore an increase in value for maintaining their health. These two water sources each had two separate sources of minerals one was in a layer of rock strata above the valley floor and the other was the crusted salts or brackish water on the lake bed. These provided a reliable source of minerals and water to the desert bighorn sheep that occupied what is now in legal definition the Newberry Wilderness. The other event was the occupation and drying out of a water source known currently as Willis Wells that is at the foot of Ord Mountain on the north side. The Willis’s were a husband-and-wife team that raised cattle to sell to the various mining outfits on Ord Mountain at that time. They lived right on the water for 10 years and aside from dropping the water table to its present level 10 or 15 feet below the surface their presence made this water mineral source unavailable to the Desert Bighorn Sheep. After they left it was still used for cattle and had a lot of human occupation and activity. Eventually this point mineral water source was forgotten by the desert bighorn sheep. Presently nobody lives at Willis Wells and the water is at the bottom of a 15 foot shaft completely unavailable to anything but a butterfly. This left this particular herd of sheep with only a few very poor and spotty mineral sources on Ord Mountain. A genetic survey taken in the year 2002 by Dr. Clint Epps indicated that this population was highly inbred, that is to say it had low genetic diversity, with this genetic situation and low population number 25 to 50 head we have a scientific basis to expect poor health and low reproductive ability. It is reasonable to conclude with this situation that at some point, if nothing happened in a positive way to this herd it would have died out taking with it a certain portion of the original genetic diversity of the species. The next positive event that occurred to this population was the installation of a number of big-game guzzlers that is artificial water sources, on the Twentynine Palms Marine base. The reason for this was to use water to bridge individual sheep from the Sheep Hole Mountains into the Newberries. Presently we have DNA evidence that indicates this has happened, but to what degree I’m not sure. No doubt though, this influx of new DNA is of great benefit to the health and reproductive capacity of the Newberry herd. It is my belief that among the artificial water sources on the Twentynine Palms base, one or more of them are a point mineral water source. This may be due to the aerial bombardment and artillery used in this area providing the right kind of pulverized rock as a soluble mineral source. When rock is pulverized artificially or naturally the surface area to mass ratio changes exponentially to a point where the rock is readily soluble. In my opinion this makes a huge difference in the sheep’s ability to digest and process these minerals. One can look at numerous examples were various mines and quarries have pulverized rock and then put out a water source then suddenly there is a population of desert bighorn sheep centered on this binary resource. Currently we can conclude that the sheep on the Twentynine Palms base is an outgrowth from the Newberry herd. Yet at some point, due to the fact that it has its own point mineral water sources and large geographic area, we will have to start referring to this as a separate herd, the Twentynine Palms herd. To fully understand what happened on the Twentynine Palms base it would be useful to understand what did not happen in the West Ord Mountains. There has always been a few sheep running around in the West Ord’s, coming from the central Ord Mountain. But they have never stayed very long or constituted a population. Yet there are three good Springs each one of which could provide enough water for 20 or 30 sheep. In the past they provided for this many cows. The area that comprises the Newberries, Ord, and Rodman Mountains once had about 250 cows on it. Now it has only about 25. So one does have to ask why this sheep population started in the Twentynine Palms base that is much further away from the population that inhabits the Newberry and Ord Mountains than the essentially unpopulated West Ord’s. There is also in the West Ord’s another three springs that could provide for a number sheep with a little effort. For three or four years we had a camera on one of these springs, known as Badger Springs, and never saw a single sheep, yet in the hills above that spring we could find sign that some sheep were in the area though not many or very often. For the sheep to get to the West Ord’s they have a relatively short walk and often walk right past a place known as Saddle Springs. I have monitored this spring for decades and I don’t think I’ve ever found any sign of sheep drinking water there, yet within a couple hundred yards of it you can find tracks and droppings. The West Ord Mountain is a relatively large area with good escape terrain and reasonable vegetation. Yet it has no resident sheep or any large seasonal occupation. I believe the reason for this is in understanding the relationship between Desert Bighorn Sheep and minerals. Now as we look at this mountain range the West Ord’s and contemplate the idea that there’s a lack of minerals in this area we might consider the reason for this lack of minerals lies in the type of rock that is there and this rock throughout the West Ord is granite. Granite with few yet notable exceptions does not provide minerals as granite is a hard insoluble material that rarely degrades to a fine powder and only rarely will you find a point mineral water source in granite. Whatever minerals granite might have they are securely locked up in this exceptionally hard material. So while West Ord is much closer to the central Ord mountain sheep population it has never spurred a separate population or major seasonal occupation. Even though it has lots of room with good escape terrain water as well as good vegetation. The Twentynine Palms base is much further away but I believe the difference there is one or more point mineral water sources that is comprised of artificial water and artificially pulverized rock, and thus has its own stable definable population. Not all mineral sources are a focused point mineral water source. Some, for lack of a better term I referred to as a diffused mineral source. A good example of this is the Old Dad Mountains this mineral source is relatively large perhaps 15 or 20 miles long and a couple miles wide with numerous water sources. This qualifies as a mineral source because it’s essentially all limestone. However, this particular type of limestone is not the best mineral source available, as it does not decay naturally to a powder and thereby is not readily soluble in a bighorn sheep digestion system. When this rock does decay it ends up in small pebbles and grains about the size of course sand which the sheep use but it is not that good of a mineral source. However, because this mineral source/mountain range is large they are on it for days at a time this makes it more effective. These diffused mineral sources have another route for the sheep to ingest mineral that can be observed, where they eat some of the small annual plants roots and all. Of course these roots will have some fine powder dirt on them that make them an excellent mineral source. Across soda dry Lake there’s a place that used to be known as Soda Springs now Zzyzx where among other mineral sources there are places where this type of limestone is in powdered form due to mining and construction and the sheep use it in this form as a point mineral water source. So now we’ve talked about the focused point mineral water source as well as the larger diffused mineral sources there’s one more that is crucial to the understanding the distribution and survival of the various meta-populations of Desert Bighorn Sheep throughout the desert. That is the minerals that sheep get through the plants that they eat. Dr. Vern Bleich did a pioneering study on this subject comparing the Old Dad Mountains to a mountain range near Death Valley. The basics of this study was comparing a strata specific plant community, in this case the plants growing on the limestone of the old dad Mountains and its mineral value of these plants to the Bighorn Sheep in comparison to plant communities elsewhere. When we look at these different types of mineral sources and try to gauge their relative importance, one of the first things we will notice is that there is a seasonal preference. The most notable is a preference in the summer for the point mineral water sources and then in the winter for the diffused mineral sources. Some of these winter resource areas are often referred to as ram pasture due to the fact that they are predominantly used by rams during winter time, and as for the females they will spend time in areas often referred to as lambing grounds. I have some ideas about this I believe will reveal a mineral component to both of these. That I plan to explore in a later write up. One of the possible ways that we can get an understanding of this is to take samples from various places along the horns of a big ram and then run these samples through a gas chromatograph. This will tell us what elements are in the horns and where they are in relationship to the annual growth rings. We could also use the rams horns as a control for a study in the same manner on the ewes. Of course the ewe have to go through the various stages of pregnancy and lactation as well as their own seasonal variation of resource occupation and use. While this will certainly be a complicated issue it will shed new light of the overall health of Desert Bighorn Sheep and what it takes to grow a large set of horns. While the ability of the Desert Bighorn Sheep to grow large horns encompasses many things such as DNA, overall health, the proper weather, and so forth, I’m quite sure that a high levels of the proper minerals is critical to producing a large set of horns. Through a scientific investigation like this we will be able to understand what minerals influence good health and large horns. I believe that eventually we will find out that acquiring minerals is one of the major drivers of bighorn sheep evolution throughout the world. If we look at the horns of a big ram they are obviously part of establishing mating dominance much like a peacock’s tail. To grow a large set of horns will require a ram to use his sensory perception that is taste, smell, and vision to acquire the maximum or proper amount of minerals. This ability will affect his success in mating in his own lifetime and echo through the generations. So this mineral sensory perception and large horns becomes a feedback loop with very real short and long-term consequences. It may come to pass ,that someday in the future, the record books such as Boone and Crockett and Pope and Young will indicate as to whether the herd was scientifically managed or not. At the very least when this technology is implemented this will become a controversy. Another possibility that could be added to such a study is to take these kinds of samples from the various bones of these animals and subject them to the same kind of chemical investigation. Perhaps this may only be done in a hunt zone where you have the availability of fresh bone that has time and place information attached to their acquisition. Taking on this kind of investigation will give us another window into how minerals affect bighorn sheep populations. This kind of knowledge will eventually give us an inventory of what minerals are out there, where they are, and their effect on various meta-populations. Yet another possible line of inquiry based on samples would be to investigate the relationship of minerals to the quality and mass of hair growth. No doubt there is some relationship between the mineral environment and the growth of winter hair. It goes without saying the growth of a good warm layer of hair would influence the survivability of an individual sheep. We may see a difference between the rams and ewes due to the seasonal difference of the habitat they use. Then if we compare one population of desert bighorn sheep to another in this respect we may find further insight as to the value of minerals and survivability. Another avenue of inquiry that could be done when one has an understanding of the elements and minerals that are present in the horns and bones and hair is how the direct mineral uptake affects what plants the desert bighorn sheep choose to eat. As an example of this I offer these observations. For many years there were no bighorn sheep at Zzyzx/soda springs. This area is truly mineral rich. There is the soda dry lake that has crusted salts on it that the sheep use, as well as pulverized limestone and mineralized or brackish water. This place could be considered a very large point mineral water source. Also the surrounding mountains seem to be of a highly mineralized granite with very stunted vegetation growth. When examining this environment it is evident that along the many game trails that access this area, the sheep eat a lot of creosote bush material, which is unusual. Few if any animals eat this plant at all let alone on a regular basis. Over the years I have observed in other mountain ranges a few sheep nibble on creosote once in a great while. Even a cursory examination of this bush will reveal that it has a high chemical content that makes its leaves often sticky with the sappy substance (hence creosote) and has a strong chemical odor. As we continue along this thought it is important to understand that the sheep at Zzyzx/Soda springs were not there in an unbroken occupation of this place going back to ancient times. Rather they have reoccupied this place less than 10 years ago. What this means is, this out of the norm eating of creosote at this location is a recently acquired behavior. One can only wonder why they are doing this. Is this some sort of catalyst, perhaps an antidote to some detrimental chemical in one of these mineral sources. The answer may be written in their horns or bones or hair. Of course the answer to this question would have ramifications to other meta-populations. I believe when we understand a place like this we will understand that other meta- populations are tuned in to their mineral environment and this affects the plant they select for eating. Even if it’s not as obvious as it is at this location, one of the important concepts of this flexibility, this tuning in to their environment is that this is essentially one or more feedback loops in play. The feedback loop is one of the true forces of nature. This means that once a population is establish it will learn what plants to eat in relation to their local mineral sources such that they will know which plants to use for minerals directly and which ones to uproot for their minerals that come with them. Also they will memorize the placement of the smallest seemingly insignificant pockets of pulverized mineral in their territory. Then through the generations their body will evolve to maximize the efficiency in utilizing the various resources in this particular bighorn habitat. Just how many generations are needed to acquire what level of integration, at present is an open question. Perhaps further DNA studies will reveal such things. If we look into the past, perhaps in a time when there was more rain, we might find the answer. Such conditions would also mean more plants, more springs, and therefore more point mineral water sources. During a time such as this we would find a condition where Desert Bighorn Sheep populations could start in territories where they couldn’t before, then through multiple generations become tuned to the resources in that specific geographic area. These populations could persist after things dried out due to tuning in their behavior and genetics. At a later time when a disease wiped out this population and adjacent herds were also suffering from disease and habitat fragmentation as well, these herds on adjacent mountain ranges would not have the ability to recolonize the vacant area. As the dynamics of the surviving herds would be impacted, they were no longer properly tuned to their remaining habitat. The few strays that wander into this otherwise open and available habitat would not be tuned in to it. That is to say their knowledge, behavior, and genetics were not acclimated to it in such a way that they could not stay and recolonize it. In conclusion what this means it might be possible to start a population with an artificial mineral water source and eventually their ability to tune into this new environment will carry the population with or without the artificial point mineral water source. Or at least not be wholly dependent upon it. Here will take a little detour as I want to talk about a Internet investigation I did on this subject. One of the first things I learned on the Internet is that supplementary minerals for deer is a very competitive cottage industry and no such sources are available for wild sheep. However there are mineral supplements available for domestic sheep that have all sorts of claims. We know that cattlemen who are economically motivated have been putting out blocks of salt for the cows for ages. So it would be safe to assume that these mineral supplements have some value. One of these supplements formulated for domestic sheep claims to be specially formulated for sheep that have been raised on Clover. This gets back to the very essence of Dr. Vern Bleich study and where it was going, as he was exploring the mineral content of rocks and how it is expressed in the plant that grows on them. Then comparing those results with the sheep droppings from the same area to see what was absorbed and what was not. Presently I do not think that this concept is used by people managing wild sheep anywhere, though I believe that someday this concept will be one of the cornerstones of modern wild sheep management. Now let’s take one more little sidetrack that will help us understand and identify how a diffused mineral source works, and how it affects the plants that grow on them, and Bighorn Sheep behavior. For many years I watched numerous salt blocks that the rancher put out on Ord mountain and I could never find a single track or droppings anywhere near them, indicating that the sheep did not use these salt blocks. This was a mystery to me because the cows that were living on the same plant resources used by the sheep. Recently I realize that the commercially available mineral supplements designed for domestic sheep are not sold in block form, rather they are in a granulated form. This got me thinking about the domestic sheep in the Newberry Valley and my observations of them. Typically when they put sheep on an alfalfa field they let it go dry for a while then the sheepherder comes in with portable water troughs and fences in the sheep and allows them to start grazing. Once they got the alfalfa stems down to the ground they tend to eat the top roots dirt and all. Of course the roots have more water in them than the stems and the dirt has minerals. This is in essence a mineral water resource. Also most certainly the roots have a different mineral profile than the stems and leaves and this may or may not be important to the sheep. With this knowledge we can now look at a place like the Old Dad Mountains a little differently. Having spent days and even months observing sheep on this particular piece of limestone, I have observed the sheep often spent a lot of time cropping the smallest most insignificant looking annual plants. No doubt the reason for this is when they pull these small bunches of grass out of the ground with them comes a small amount of dirt on their root system. This of course, will be laden with small amounts of minerals they need. I believe that this is no accident or temporary or local behavior but rather an intense evolutionary adaptation at work. If you look at the front of the mouth of any desert bighorn sheep you’ll find it only has a lower set of teeth, the front upper ones are absent. Having examined both living and dead sheep up close I can tell you that this is a semi-hard non-slippery material that’s is in the upper front mouth. And I suspect that either the lower teeth or the tongue is pressed into this gripping surface in order to distribute the force when gripping the small delicate plants allowing them to pull them out roots and all. Another way of putting this is the absence of the front upper teeth means that they don’t cut off these small delicate plants above the roots, which would rob them of the minerals attached to the roots. Now let’s take a look at the mineral sources derived from plants themselves. A lot of this will be theoretical or speculative and I am not going to take the time to note one from the other in fine detail as this is from my own observations and ideas that I believe in time will be tested in a more scientific manner. I think we will find that most plants species throughout the world are genetically tuned to grow on granite as it is the most common rock found on the surface of the earth. Then if we observe plant growth from one granite mountain range to another will find that not all granite has the same fertility. With this in mind If we look at the plants growing on the limestone of the Old Dad Mountains we will find that very few plant species grow there and the ones that do grow poorly. Any farmer or gardener can tell you if you’re experiencing poor plant growth you have a lack of nutrients in the soil or too many. A good example of too many is the numerous dry Lake beds that exist throughout the Mojave Desert. Most have such a high mineral content in them that absolutely no plants can grow on them. However when a desert bighorn sheep population has reasonable escape terrain to the edge of a lake bed they will go there and eat this soil for its mineral content especially if water is also available. This occurs at Soda Springs. So when we look at the Old Dad Mountains we can be reasonably sure that there are too many minerals in this limestone for most plants to grow to their full size, perhaps we could say their genetic potential. While this soil may not be optimal for the plant themselves it seems like it allows the plant to provide the richest possible mineral source for the desert bighorn sheep, much richer than a plant grown in a optimal soil for plants. As another example of how this phenomena can play out we might consider the Granite Mountains. 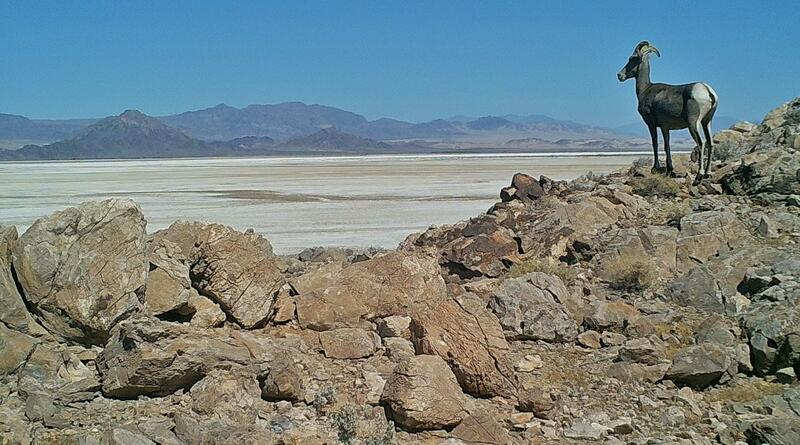 These are the Granite mountains located in the East Mojave preserve next to the Marble Mountains. Even as a kid I noticed the remarkable plant community in this mountain range. It has gigantic Yuccas, Piñon and Juniper at lower elevation that you found anywhere else as well as a wide range of other plants that seem to be larger than you would find elsewhere. No doubt this is because it has all the right minerals and in the right amount that most plants need to grow. While this is just an estimate it seems to me that living biomass of the plants on the Granite Mountains is probably on the order of 10 times that of the Old Dad Mountains. Also, perhaps the mineral value of the plants grown on the Granite Mountains has one tenth the mineral content of the Old Dad Mountains. If this is so it would mean the sheep has to eat 10 times the amount of plant material to get the same amount of minerals, which of course would be impossible. This idea about mineral to plant biomass relationship may be linear or on some sort of exponential curve. Someday this will be revealed when somebody pursues a scientific measurement of this phenomena. Now when you consider the fact that granite due to its incredible hardness is very unlikely to be a diffused mineral source like limestone with no direct ingestion and little minerals in the plant/root route as well, and of course there is little chance of finding granite in a naturally powdered form let alone near a water source. We can see that it would be incredibly hard for a sheep or population of sheep to make a living in this sort of environment. Here we must consider that not all granite is the same. As an example of this we can look at the Sheep Hole Mountains. Here we find a granite where very few species of plants grow and the ones that do grow there grow very poorly. To the eye the granite of the Granite Mountains and the granite of the Sheep Hole Mountains looks pretty much the same yet the plant communities on these two mountain ranges tell a different story. And of course we can reiterate the idea that if plants do not grow well it’s because they have too much or too little of the nutrients they need. While the plants differ greatly on these two mountain ranges there is another difference between the two. And that is that the Sheep Hole Mountains have a bighorn sheep population, and the Granites have few if any. Because of the hard unyielding qualities of granite I believe it’s reasonable to assume that there’s a population of sheep on the Sheep Hole Mountains due to the fact that the sheep are getting there minerals primarily from the stunted mineral laden plants. This is only one of a possible three ways to get minerals and in the case of the Sheep Hole Mountains it seems this one source is just barely adequate. It is my understanding that the Sheep Hole population was transplanted there from the Old Dad Mountains. These two populations are hunted so we have many years of horn measurements from both of them. Of course the horn measurements on the Sheep Hole Mountains show much smaller horns. There is some correlation of horn base circumference to skull size and from this we can deduce that the sheep in the Sheep Hole Mountains are smaller in body as well. No doubt this is due to the fact that they are not getting sufficient minerals to grow to full size, in reference to their ancestral population in the old dad Mountains. One might ask what else could it be. Given these ideas one can understand or at least have a theory as to why there are few or no Bighorn Sheep in the Granite Mountains and it is due to a lack of minerals. For years most people considered the fact that there are mountain lions in this area and this was the reason this population of bighorn sheep was nonexistent or suppressed. While this should be considered I think it’s only a minor consideration given the lack of minerals. If this situation was mitigated, that is, some minerals were added to this range perhaps we would see a increase in occupation by desert bighorn sheep it would be a worthy experiment with far-reaching ramifications. This is especially true when you consider the Granite Mountains are right next to the Marble Mountains which has perhaps the largest, densest populations of Desert Bighorn Sheep anywhere. The significance of the granite mountains being next to Marble Mountain population is that if conditions were right in the granite mountains it would easily be repopulated or at least have a significant occupation in spite of the freeway. But this has not happened and one can wonder why. Once you factor in the differences in minerals this lack of population in the Granite Mountains is not likely to be solely about mountain lions. No doubt one must consider the effects of barriers and distance especially when we consider how it compares with the Clipper Mountains. One of the things I think this shows is that a mature Desert Bighorn Sheep, male or female, can only spend so much time in a low mineral environment before returning to useful mineral environment that it knows, in essence they have a thirst for minerals. I believe no understanding of desert bighorn sheep and minerals would be complete without some understanding of the extraordinary large and dense population of Desert Bighorn Sheep in the Marble Mountains. One of the first things that we can observe about this mountain range is that from the freeway to route 66 there is no place where plants grow well, except in the two washes that flank its West and East side that has sand that has as its origin the granite mountains. What this means is that every plant throughout the mountain range contains the maximum amount of minerals it can hold and still survive. This is similar to what we see in the Old Dad Mountains. However, if we look at the strata that the Marble Mountains are made of, we find that it isn’t just one large piece of limestone like the Old Dad Mountains, rather it is made up of a variety of stone such as lava rock, something I believe to be a volcanic ash sedimentary rock, and granite. Indeed it has the full cornucopia of geologic possibilities, and all in a highly mineralized state, so high in fact that all of them are detrimental to plants and advantageous to the Desert Bighorn Sheep that eat them. The fact that there are so many different types of rock in this mountain range means a single plant species in its process of living in this mountain range not only delivers the maximum amount of minerals to its leaves and stems, it does so from different types of rock. Thus a single plant species can provide the sheep with a wide ranging mineral regiment. Also this collection of diffused mineral sources are all big enough that sheep will spend enough time on them eating the plants and take advantage of the plant/root mineral source as well the small amount of minerals that they can access directly from the different rock strata. So even if this direct route is not highly efficient due to these minerals not being a powdered form they are there on them long enough to make a difference. Then there is Vernandyles and Teresa Springs. They are classic point water mineral sources, of which I believe to be of extraordinary quality such that someday when the science is done, it will be understood that these minerals that are available to them in a natural powder form is literally the stuff that sheep are made of. So important are these two springs to this population that I believe that if you fence them off not only with the population in the Marble Mountain decrease so would the population in the Clipper Mountains. While this is all based on my field observations I believe one could investigate this further by looking at the radio collar data that is available in this range. I believe it would show that sheep would leave the clipper Mountains and take a very direct route to these two springs and then take their time going back to the Clippers. In conclusion I believe that there will soon be a paradigm shift in wild sheep management that will have at its core and understanding and the manipulation of the mineral resources that wild sheep need. With this understanding and manipulation I believe there will be a large increase in the number of sheep and improvement in their overall health. When faced with a problem that is hard to troubleshoot. Check for fingerprints what have they done now. Don't believe anything you hear and only half of what you see but do listen to them. Divide and conquer, insurmountable jobs are just a lot of small tasks. Believe in your indications unless proven otherwise, at the moment it's all you have. Seat confirmation from an independent source get a second opinion. Fix what you find broken even if it doesn't seem to relate, you might learn something. If you don't know what it is rule out what it isn't, what you've tried so far didn't work. The wind is a sizeable force and has a tremendous effect on the structure and plant and animal life in the environment. This lecture will help you learn and understand the wind and its effects in shaping the local environment.